A web developer is a catch-all term for many different programming jobs from front and back-end developers to user experience professionals. These professionals work as part of a team to determine the web specifications necessary to meet client requests and write code to program a website or software to act in the correct way. Use this web developer job description to see what they do, how they do it, and the background they need to do it well. A web developer job description emphasizes the importance of projects over credentials and emphasizes showing how you design web projects. A 40 hour work week with approximately half of this time devoted to original design might be needed. As far as the web developer school requirements, some employers might ask for a bachelor’s degree. Meanwhile, others only require a high school diploma with technical training. The median salary is $64,970. Web developers write the code that makes websites and software interactive. They create accessible web pages and solve problems as part of the information technology department. The following responsibilities are likely to be seen in web developer job postings. Take a systems approach to assessing the needs of a client or the company they work for. Create a sandbox or pilot space to test different solutions and designs. Contribute to the programming community by sharing problems and different code. This reduces replication of same efforts. Work with the user experience person to test the website and see if it is aesthetically pleasing to users. Track website usage with tools such as Google Analytics. Use this information to identify when people leave the website and redesign to present exits from certain pages. Collaborate with many different people to successfully create all aspects of the company’s web presence. These responsibilities were based on a list from the U.S. Bureau of Labor Statistics. Shared content skills. The programming community has a culture of sharing content, code, and solutions through forums such as GitHub or Stack Overflow. Being willing to share problems and solutions helps build community understanding. Problem-solving skills. A problem-solving mentality is essential before interacting with any code or software. Recognizing that failure is part of the process and learning from past mistakes makes for a capable developer. Persistence skills. Being immersed in code for hours can be tedious. This is particularly true when a simple error is causing your page or project to fail. Being persistent, tracking work, and being detail oriented will all pay off. Coding and programming skills. Any web developer job description is going to emphasize various programming skills. 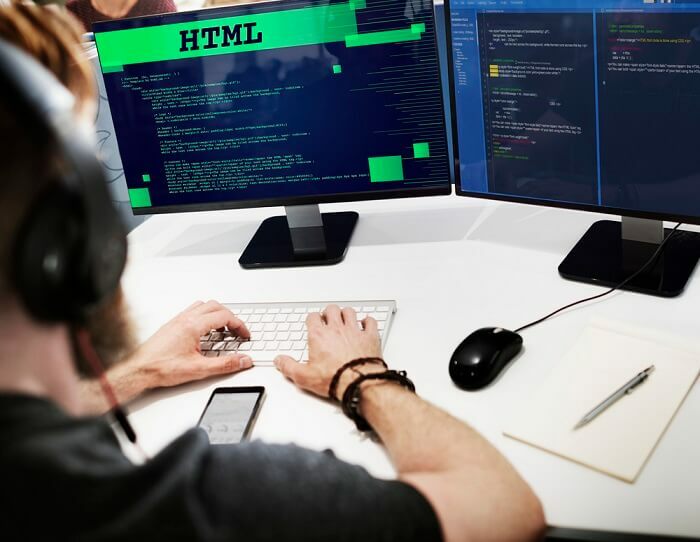 Knowing different areas such as HTML, CSS, Photoshop, jQuery, and PHP is highly useful, if not recommended, in the majority of web developer positions. Web development is one of the most popular areas to get a fast certification for those looking to enter the workforce or change careers. These accelerated programs can make it seem like it is easy to become a web developer. The requirements for a web developer range from a high school diploma to a bachelor’s degree. This depends on the level of complexity of the tasks required for the developer. What is more important is that they have the necessary technical skills. In addition, acquiring soft skills such as communication and critical thinking help you to enter this career field. Pursuing education to become a web developer is often one of the most confusing steps in the process. While other fields will have required education or certification, there are many paths for this particular profession. For example, some people may follow the traditional way of earning an associate’s or bachelor’s degree. However, some will learn on their own, and yet others will complete weeks-long programs from places such as Treehouse. You can look here at other good paying jobs that do not necessarily require a college degree. According to CNN, a bachelor’s degree is not a requirement because there are too many positions and not enough developers. Also, if the developer works for themselves as a freelancer, then the companies they contract will be less concerned with their degree. There are certificates that web developers can earn. However, a web developer job description will show that results matter more than credentials. There are a plethora of companies that offer certification. Besides the fact that these are not considered necessary for most web development positions, it is hard to know the quality training programs from the ones that function as diploma mills. In addition, there’s a plethora of web developer courses out there, some more useful than others. One area where college graduates may have an advantage over people who are self-taught is in a portfolio of projects and assignments. These graduates are more likely to land entry-level development jobs simply because they have an established line of work. However, web developers without a degree can also build a portfolio. This gives direct evidence of your experience and skill level. Thus, it allows potential employers to assess and possibly hire you for the right level of job. One way to build a portfolio is to work on freelance or pro bono projects. You should also consider putting your code on Github and add it to an open source project. This will show that you are ready to communicate how the field does and willing to work as part of a team. Most web developers work full-time. Approximately 1 in 7 web developers is self-employed. It is crucial for them to know when they are making good progress and when they need to take a break from work. Most developers will put in approximately 4-6 hours of design work in a day. They will also answer emails, search for solutions to problems, and make sure they stay organized in their projects. It is likely that the developer never thinks the project is good enough. They could spend hours changing insignificant aspects of the site. Knowing when it is time to move on is essential to keeping a reasonable work schedule. Any search of a web developer job description will show that there is tremendous growth in this field. According to the U.S. Bureau of Labor Statistics, the field should grow 27% by the year 2024. As more and more people do everything online from shopping to banking, we will need more sites and updates. Two other factors that impact job growth will be responsive design and accessibility. A web developer who can create accessible websites that work on a range of devices will see more job opportunities and faster track for advancement. The median salary is $64,970. The highest paying industries are information services, publishing industries, computers system design, and nonprofit organizations such as religious institutions. Web developers will always be able to find a job. Do proactive work to research what skills you need for the type of job you would like to have. Conducting an internet search using the terms “web developer job description” or “web developer job requirements” will return results to inform your career planning trajectory. You can also look into the software engineer job description for more career opportunities in IT.